On Computers » BROTHER, WHERE ART THOU? A reader innocently called a tech support phone number he saw on the Brother Printers website. It turned out to be a scam. Unlike “click bait,” which leads you to fake news stories or other web sites, this one goes after your wallet. He added: “They told me there was no way that I would get the printer to work without their firewall!” But he did after watching a tutorial on YouTube. The same thing happened to our friend Ida last year. She went to the Brother Printers site, called a number listed there, and was scammed. Joy used Windows’ “System Restore” to get her computer working again. Remember: If it seems fishy, it probably is. We like Brother Printers okay, but this is a bad situation. We notified them about the problem more than six months ago. A spokesperson wrote back and told us they were aware of everything and were working on it. Slow going; apparently they take a lot of coffee breaks. We don’t’ have the patience for video editing. (Actually, we don’t have the patience for much of anything, which is why we write short items.) 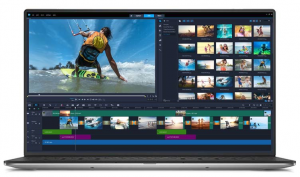 What we like are programs that do all the work, like “Fast Flick” in the new Corel Video Studio Ultimate 2018. The $100 program finally makes it simple, three clicks and you’re done. Click to choose a template, click to add pictures and videos, click to add text. (Okay, it’s four clicks if you want to change the background music.). The result is amazingly professional. Our movie had fast dissolves, picture-in-picture, nice transitions and so on. The program does much more, if you’re adventurous. You can show multiple video streams simultaneously, remove distortion from wide-angle or action camera footage, create a video in 360 degrees, and create a stop-motion animation. Some of the tutorials are great, but the one on stop motion left a lot to be desired. You can get a free trial at videostudiopro.com. If you just want a simple slideshow, try the free Google Photos at Photos.Google.com. Click “Create” and choose from nine templates, such as “They Grow Up So Fast,” “Selfie Movie,” “Doggie Movie,” “Meow Movie,” “Mother’s Day Movie,” and “In Loving Memory.” For a Valentine’s Day movie, Joy clicked on Bob’s face, then hers, on a page that showed all the faces of family and friends appearing in previous photos. Google Photos automatically found photos with us in them and put them into a romantic slideshow with music. Can’t beat the price. Medigo.com recommends medical care in clinics and hospitals abroad. Current estimate is that 1.5 million Americans have made these trips, sometimes called “medical tourism.” Savings are huge. Bob’s doctor said he is worried about the trend. Here’s a graph showing their affiliations with more than a thousand hospitals. The “quality” destinations are higher quality than what people in the U.S. have been able to find, but this is very much from an English-speaking perspective. For example, India is also very popular as a quality destination from neighboring countries like Bangladesh and Sri Lanka, but it is definitely a cost destination for patients from the US and Australia. DogGIFpage.com has sweet and hilarious short videos of dogs. Let’s face it, dogs are cute. A reader said that when he asked his Google Mini to play music, the voice in the box said he didn’t have a music plan. What’s up with that? In the Google Home app on your phone, which you’re asked to install after getting a Google Home device, you can set your music to the free version of Google Play Music, Spotify or Pandora. We subscribe to “YouTube Red” for $10 a month, to improve the range of music we get. Tap “Google Home,” then the hamburger icon (three stacked lines), then “Music.” Tap the service you want to use. You can also say, “Hey Google, play KLRE radio,” or your favorite station. It comes in from TuneIn Radio. Google isn’t good at calling up radio stations from other states, however. But you can do that easily on your computer or phone. Search on “sports radio in New York,” or whatever category and state you like. If you have an Amazon Echo or Echo Dot, you get more choices including Amazon Music, Spotify, Pandora, iHeart Radio, TuneIn, Gimme Radio, and Sirius. For a change, instead of asking Alexa for a favorite tune, we browsed the library on our phone in the Alexa app to get ideas. When we saw something we liked, we tapped and it started playing on the Amazon device. You can also listen to Amazon Music on your computer through the free “Amazon Music” desktop app. We like “Classical for Babies.” Years ago, Bob read a study that found playing Mozart eased anxiety in hospitals, particularly mental wards. Bach had a similar effect. Back to babies, they seem to like classical music from the Baroque period.